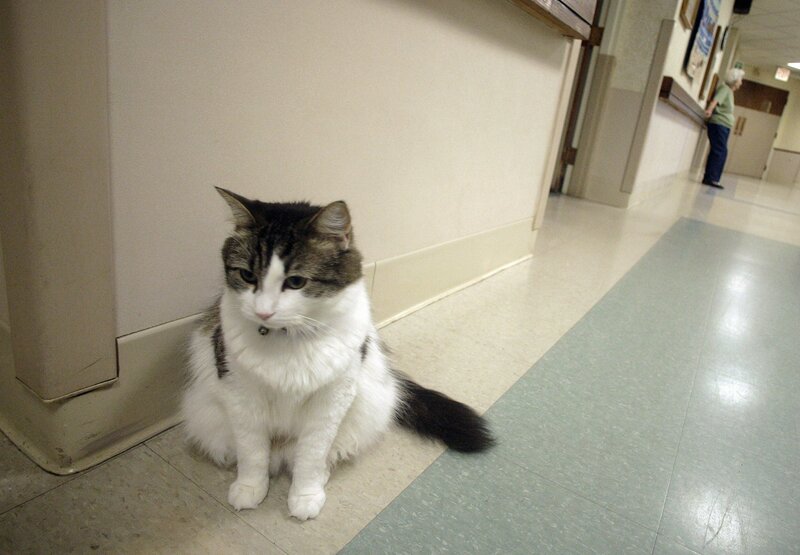 The story of Oscar the “psychic” cat first emerged in 2007, but Oscar has continued to fascinate the staff at Steere House Nursing and Rehabilitation Center in Providence, Rhode Island, over the years, and to comfort grieving families. Oscar lives at the rehabilitation center and when he visits and stays with a patient, it’s a sure enough sign that patient will die within a few hours that the nurses call the patient’s loved ones to come for his or her final moments. The medical journal article was not a scientific study of Oscar’s abilities, but rather a narrative of Oscar’s actions. After seeing Oscar staying with Mrs. K, the nurse called Mrs. K’s family to come to the center. She also called a priest to perform the last rites. The family stood around Mrs. K, and one of her relatives asked what the cat was doing there. Another replied that the cat was there to help Mrs. K to heaven. Half an hour later, Mrs. K died. “With this, Oscar sits up, looks around, then departs the room so quietly that the grieving family barely notices,” Dr. Dosa wrote. Are Babies, Children More Likely to Be Psychic Than Adults?